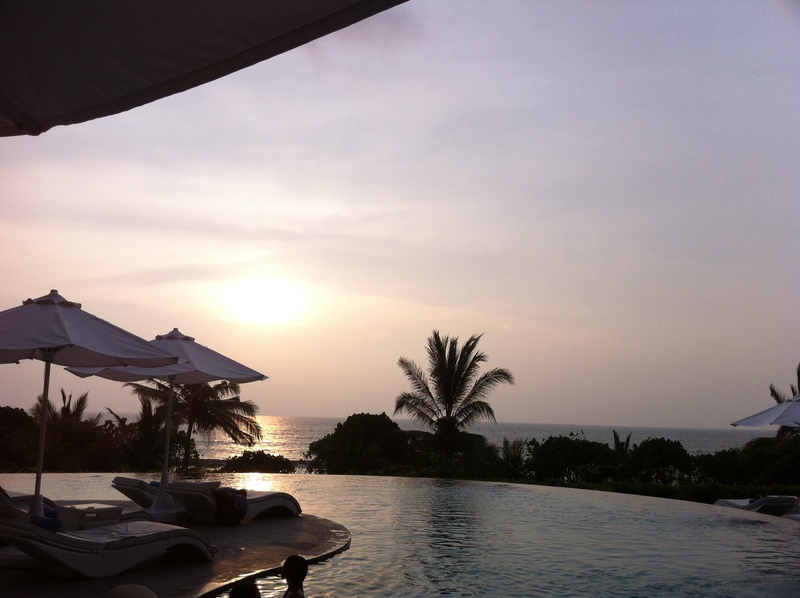 A week in Bali is not enough, but it is a great start to understanding and appreciating this lovely island paradise. Bali is part of the Indonesian archipelago, situated near the equator. The climate is tropical, lending to Bali’s designation as a great vacation and honeymoon spot. But what we didn’t know is that this small island is not small at all, and is in fact a conglomerate of various cities all with their own unique flavor. The currency is the IDR (Indonesian Rupiah) and is about 1 dollar to 12000 rupiah. This can be a very affordable country to visit, minus the flight and accommodation costs of course. We also chose to rent a private car with driver on most days (this is the best way to explore Bali), which was about $50 a day (we used Baliblisstours.com, but recommend looking into others if you need more of a tour guide). This was our basic itinerary, but what I can tell you is I will have plenty to do when I go back someday! After a morning in Denpasar, we had lunch on the beach in Jimbaran (a must do if you are in the area, as you can sit right on the beach). Our driver took us to a spot which was probably not the best, but the fish was fresh and we enjoyed our first taste of Balinese food (a mix of Thai/Chinese/Indian spices on chicken or fish, served with rice is the staple). 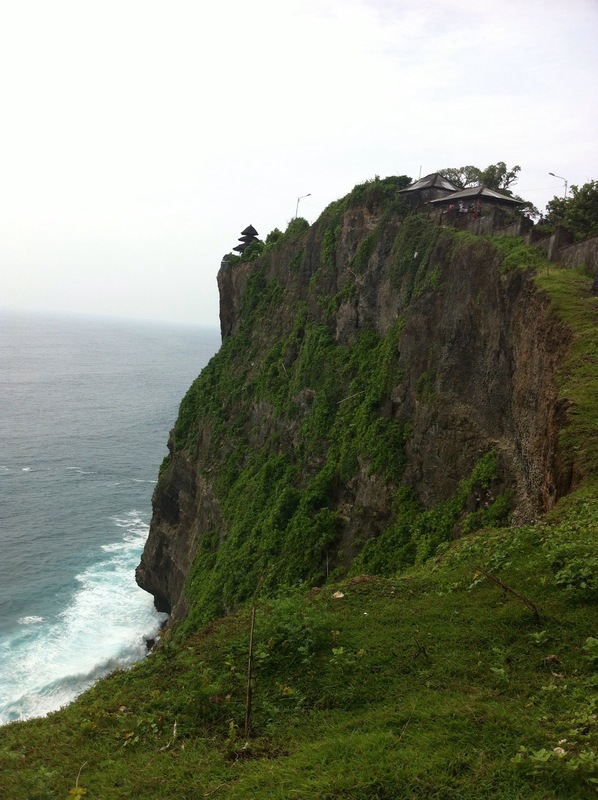 We then ventured south at the recommendation of a European living in Bali, who said – check out the temple at Ulawatu. The Balinese are predominantly Hindu, so many of their temples are for the various Hindu gods. We headed south after a drive through the bustling city of Denpasar, down to the south western tip of the island at Ulawatu. There we explored the lovely temple on the cliffs and took a long walk on the cliff walk, before heading off to explore a local beach. After sweating it out on the cliffs. 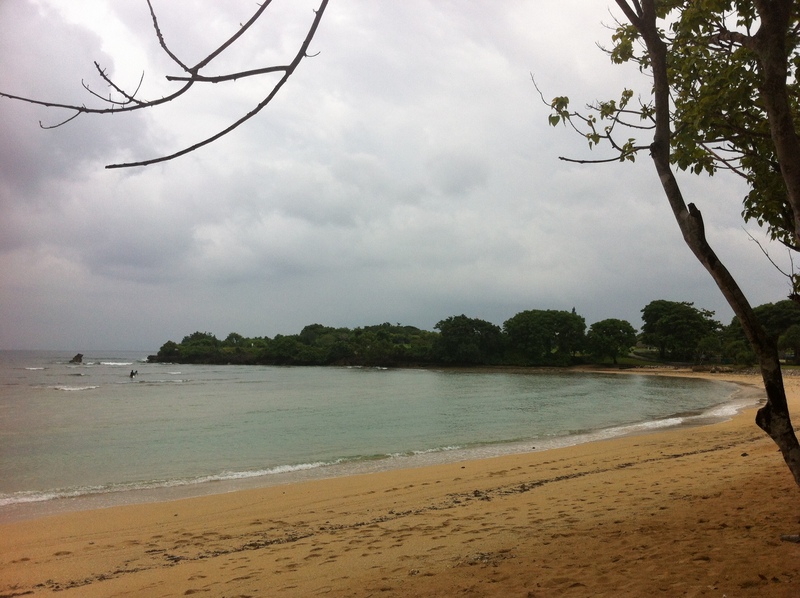 we headed to the secluded and beautiful Padang-Padang beach. This beach was found through a narrow path in the rocks, and gave way to a peaceful beach with great views and beach surf if it strikes your fancy. After a day of exploring, we headed back to the bustling Kuta (our home for the week) where we navigated our way through throngs of people to make it to dinner at Al Dente, a semi-Italian spot serving just about anything an Aussie fancies (why an Aussie, well Bali as I learned is a major vacation spot for Aussie’s looking to getaway, so nearly everything caters to them). Kuta is a coastal town, noted for its nightlife, and was one of the busiest beach cities I have visited. 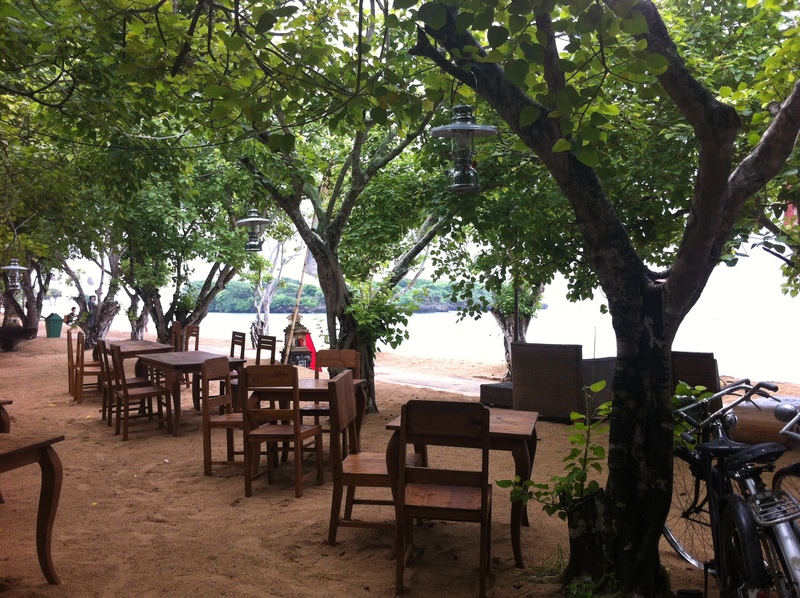 The positives about staying by Kuta are easy access to lots of food, great beach, lots of shopping and nightlife. The disadvantages are similar, there are several non-Indonesian food options in Kuta, but it does remove you from the Bali experience to eat McDonald’s for lunch. The beach is home to tons of hawkers, so you can’t sit in peace at all, though the beachfront is absolutely lovely. Speaking of hawkers, it is often difficult to walk down the street where people are constantly asking you to buy something. The Kuta nightlife seems to attract a younger crowd, which could take away from some of the class you feel in other parts of Bali. Still, home was home for us, so we enjoyed what peace we could at our hotel, and learned to drown out the sounds of the city. We had some awesome massages in Kuta ($4 – $10 per hour depending on where you go, we loved Soma Massage), and experienced some great local food as well (Rainbow Cafe and Fat Chow were some favorites). 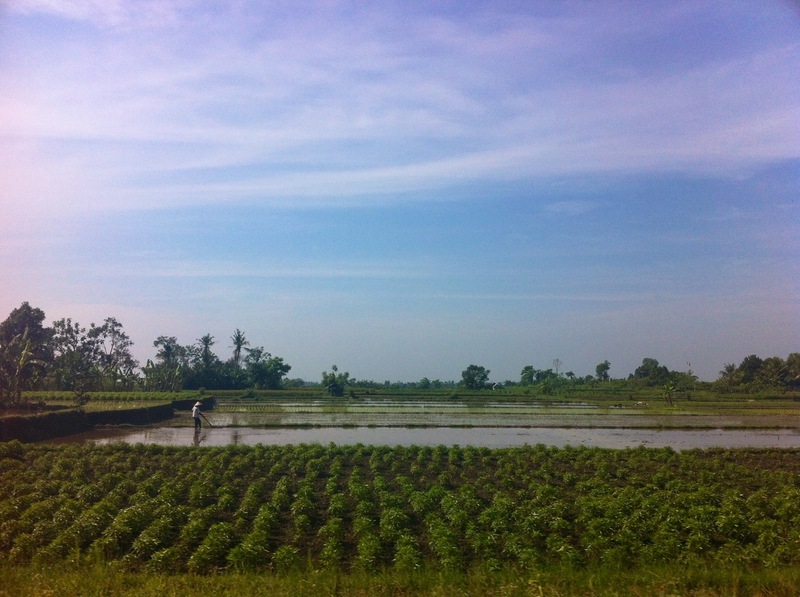 The next day we had a lovely drive through the central Bali rice paddy’s on our way to Ubud. Ubud is is home to the more peaceful side of Bali, where you find many a yogi and plenty of rice paddies to explore. We started off with a visit to the Monkey Forest, where we encountered several of our ancestors, and explored this beautiful sanctuary in the city. 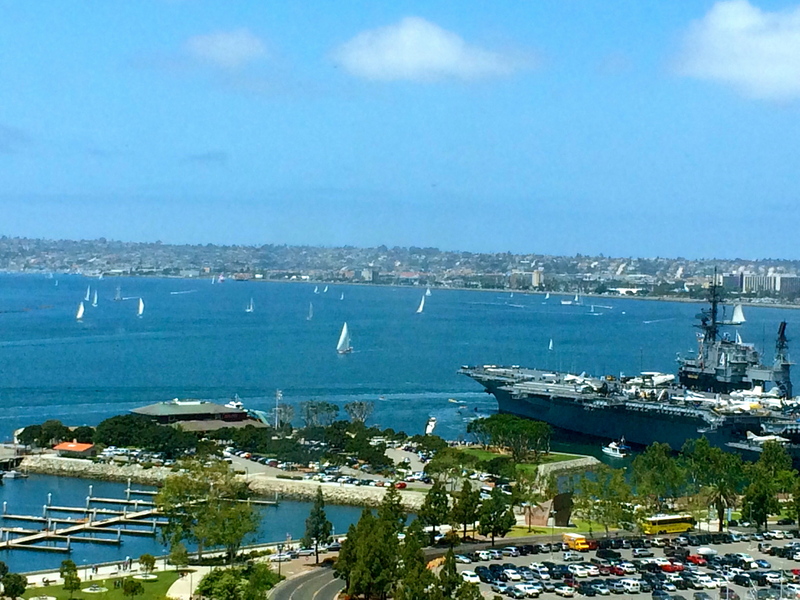 It was truly lovely, but I was sad to peer into an canal and see lots of plastic trash. Unfortunately, though Bali is beautiful, even it is not immune to the destruction of man made trash. I wish to go back some day and see this place a bit cleaned up, but still, I managed to enjoy it. A few notes on the Monkey Forest – leave all your food behind unless you want monkeys all over you, and steer clear of wearing a full skirt as the monkeys tended to grab them. We next made our way to Pura Saraswati, a gorgeous temple to the goddess Saraswati (Hindu faith), again right in the city. 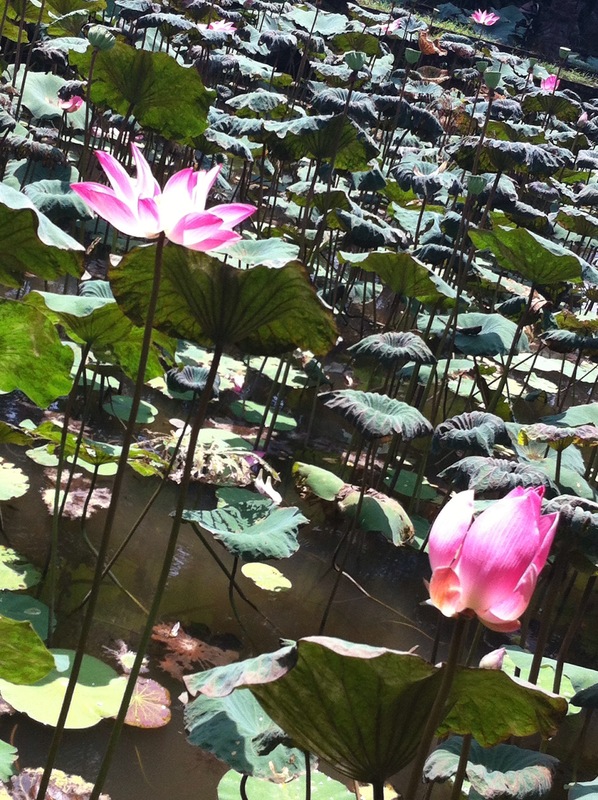 It’s amazing to step off a busy corner and end up right in this lovely lotus garden facing a lovely temple. We managed to sneak through the nearby hotel, but you may have to go through cafe lotus or Starbucks (yep) if you want to catch a glance of this serene spot. 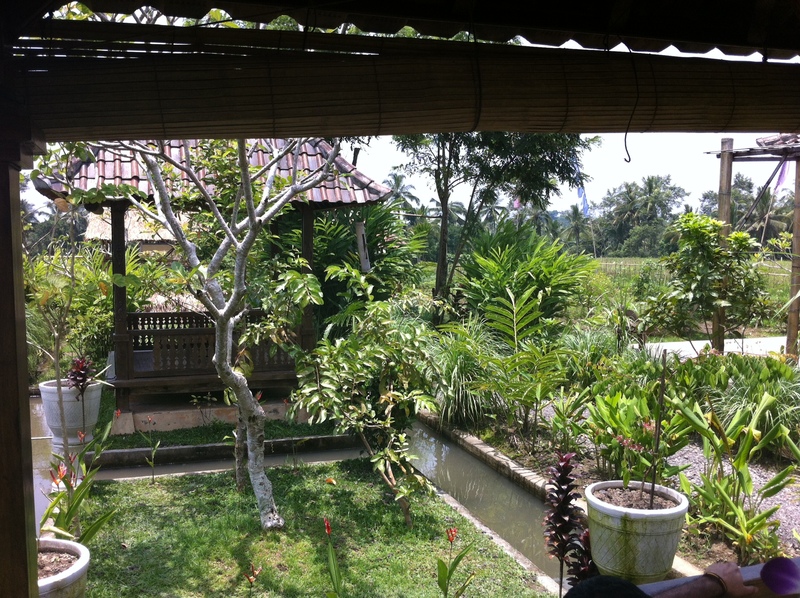 After a morning of wandering through the city, we decided to take a detour to eat lunch in a local rice paddy. This was my favorite meal in Bali, at Warang Padi Organik – a lovely restaurant a bit out of the city, serving Indonesian food in a tranquil rice paddy. 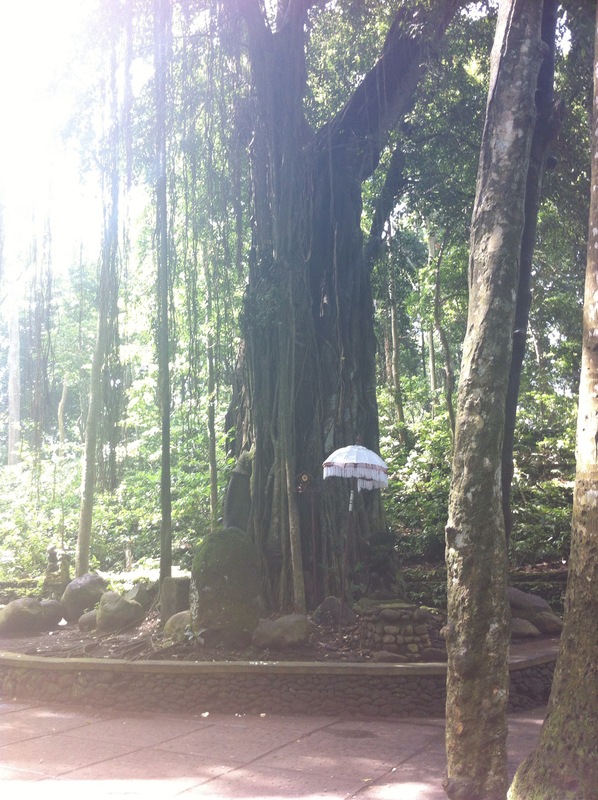 I could have spend all afternoon in this peaceful place, a must do if visiting Ubud. After lunch, we continued to explore the very lovely Puri Lukisan museum in Ubud, and partook in some shopping. I had hopes of attending a yoga class here (at the Yoga Barn, one of the most well known spots to do yoga overlooking rice paddies), however I missed the last class. Another thing I wish I experienced in Ubud was an evening of Balinesian dance, but again was distracted by other pursuits. 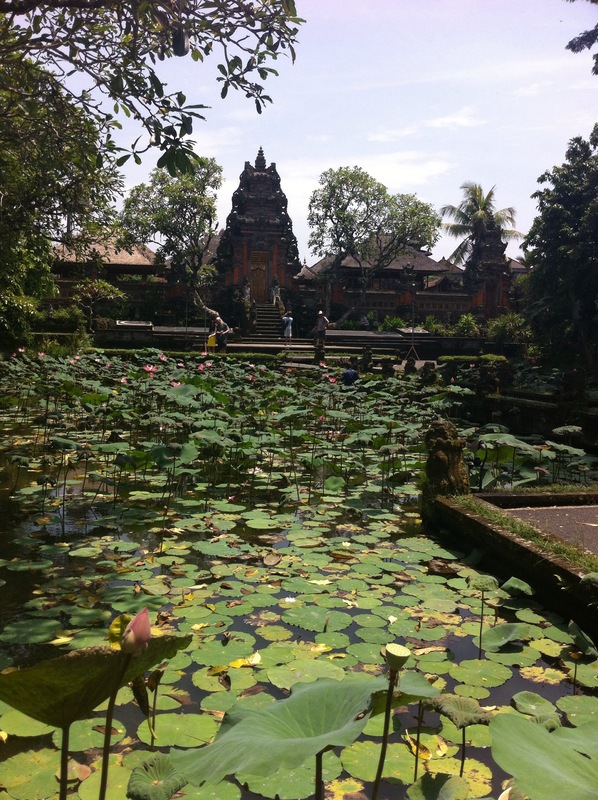 When I am back in Bali, I will hope to stay in Ubud and explore this lovely city a bit more! Early the next morning we tried our hand at surfing in Canggu. What I learned in Canggu is that I am definitely a first timer, and surfing is not as easy as it looks. Our guide, not knowing we were 1st timers, took us to a reef break (where the water is deeper and the waves stronger) at Canggu. Canggu is a favorite for surfers, and especially Russians (interesting). After a quick breakfast and a lesson on the beach we ventured out. I wiped out a few times before catching one wave, though not realizing it. 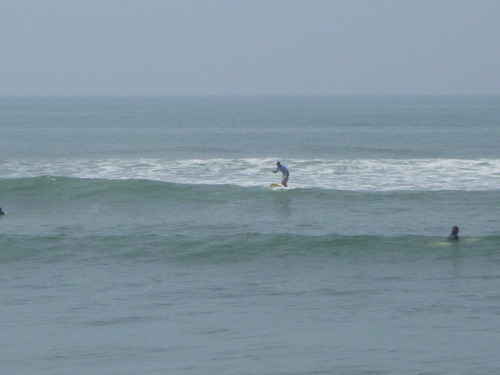 My brother on the other hand had a much better time of it, as he caught a few waves and even rode one out to the shore. Lesson learned about surfing, try a beach break on your first time, it will likely be a much more rewarding experience. After our morning surf outing, we headed back to Kuta for some R&R and more massages (I tried to get as many as I could). 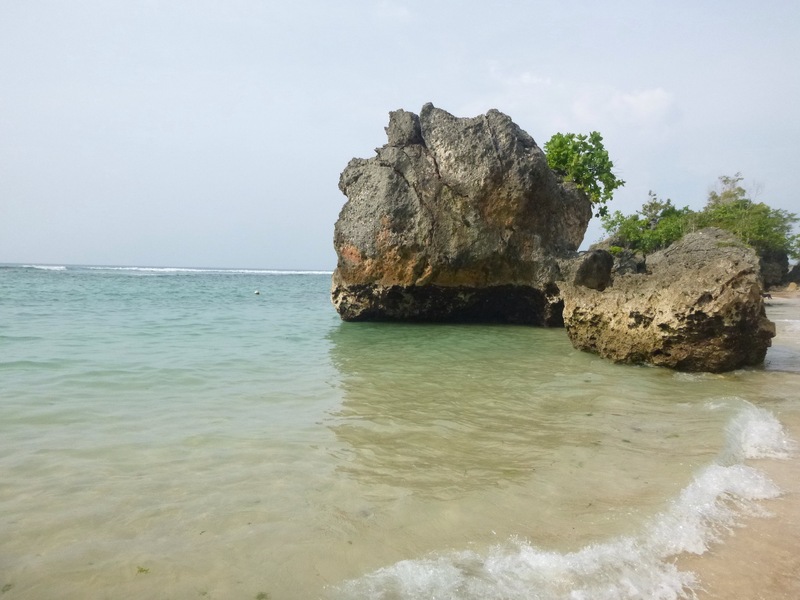 Our next outing was intended as a day of snorkeling in the clear water at Nusa Dua, however we caught up with some storms, so we ended up spending the day driving around and grabbing lunch on the beach. Nusa Dua is the Cancun of Bali, loaded with huge luxury resorts, and designed to show the western version of Bali. We had lunch at Bali Nusantara, which was highly rated on Trip Advisor. This spot had an awesome beachfront location, and lovely setting, though was very much a well designed restaurant versus a local treasure. Even our daily gelato stop was double the price here, which is pretty typical for resort living. For those of you traveling to Nusa Dua only, while you have lovely beaches, try to get out an explore the rest of the Island, as you will have much more of a real Balinese experience. We spent our last day in Bali at home base in Kuta, taking time to enjoy the pool at our hotel and the local area. It was a relaxing day, filled with more massage, and we attempted to explore some nightlife, but found it pretty dead due to the low season. It was the perfect way to end a week in Bali, and prepare for our next adventure. Being a first-timer to Bali was great, but I am looking forward to more excursions in lovely country another day. This basic itinerary helped me understand, only at the surface, a bit about this lovely country. Bali is definitely a Haute Travel spot, and one worth booking a trip to very soon!